*New Years and Easter Holiday there is no refund of deposits and payments. *Monthly rate stays are not refundable. Reservationns for 4 days or less require full payment as deposit. No pets allowed in Boana Torre Malibu main Tower and Amapas 353 tower. No guests under 18 are admitted in Boana Torre Malibu main tower. - In terms of security to ourguests, any visitor must be registered at the office (pool area) beforeentering a room and will be under the guest’s responsibility. Maximum visitorsallowed in room: 2 (1 per guest). - When your friend leaves, pleasetake him personally to the exit, so our people know he’s a friend of yours, nota stranger. - Air conditioned, light bulbsand water faucets should be turned off every time you leave the room. - As a manner of respect to otherguests, parties in rooms are not allowed after 10 pm. - Since each unit belongs to adifferent owner, everything (furniture, decorative items, appliances, etc) mustremain there. Please do not remove or transfer anything from one room toanother). - No clothes or towels areallowed hanging at balconies. - Towels stay in rooms. They arenot for the beach. - Consumption of drugs is againstthe law. - If you break anything, do notworry, just replace it. - Cleaning the rooms is every twodays. Additional cleanings should be paid by guests. $100 pesos each to be paidat the office. - Personal laundry. Informationat the office. - Please deposit your garbage inthe plastic trash containers by the stairs. - Tips for the maids are notincluded (recommended $20-50 pesos/day/pp). - Dishwashing is not included inthe cleaning. If you need this service, and the maid is available, an extra tipis required. ($20-50 pesos). - Due to the structure of thehotel and pool area, noise carries to all units; in respect to others, pleasecontrol noise around pool and entrance areas. - We are not responsible of anypersonal or valuable things left in the room by the guests. There is a safe boxavailable in your condo. - We have a liability insurance. It is the responsibility of the guest to include all transfer fees and charges to ensure that the hotel receives the full booking amount. Please follow the instructions on your email confirmation to complete the transfer. The Boana Torre Malibu staff will send you the instructions for the deposit. You will then have 2 days to make the payment. El personal de Boana Torre Malibu le enviará las instrucciones para el depósito; tendrá 2 días limite para realizar el pago. Le personel de Boana Torre Malibu vous enverra les instructions pour le depot. Vous aurez 2 jours pour effectuer le paiement. 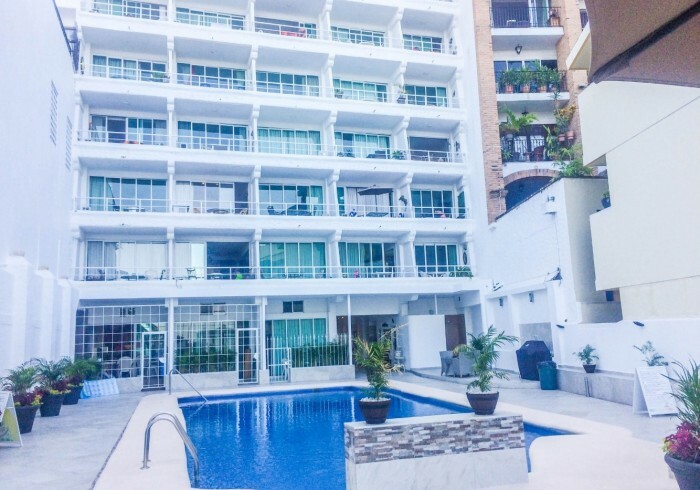 Boana Torre Malibu is the largest gay condo-hotel in Puerto Vallarta. The hotel is also open to heterosexuals. Torre Malibu is near the famous Playa Los Muertos, a gay beach known worldwide for its famous ``blue chairs`` and green chairs. A great selection of restaurants and a lively nightlife await you just a few steps from the hotel. At Boana Torre Malibu, we offer a wide selection of rooms, which are condos actually! You will have the feeling of staying in a true suite rather than in a simple hotel room.